We are standing by to help source parts, schedule a field service or provide a quote for a new travel lift, remote-control trailer or amphibious CrocLift. Interested in a New Machine? Need Parts, Service or Both? Overbuilt, but not overpriced! Quality components with more standard features than the competition. The same great technology as our boat trailers. Great for shipyards, production lines or industrial use. Establishing a partnership is at the core of our business. 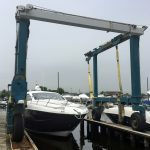 Whether servicing your travel lift or selling a new machine, sourcing a specific part or installing it on-site, we will work with vendors, suppliers and manufacturers to ensure you have exactly what you need. We offer the best value on the market and understand that product integrity and customer service are the essential building blocks to customer trust and product satisfaction. Our field service staff is second to none in reliability, timeliness and follow through to keep you up and running, whether it be a safety service or an emergency repair. Custom fabrication is at the heart of our operation. We have resources at the ready to design and/or recreate parts specific to your travel lift or forklift. Having a hard time sourcing a part? 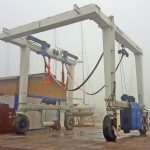 Need slings or wire rope? We have well-established relationships with major vendors to get you the part you need–fast! Our expertise goes beyond the maritime industry. The mobile repair division offers parts and service to accommodate your scheduled and emergency repair needs. Stay in Control. Call Us Today! At US Hoists, we guarantee the integrity of each part we supply or field service we perform. As the sole North American sales agent for Boat Lift SRL, all new machines come with 90-degree, remote control steering standard. 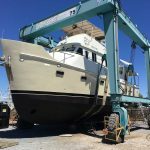 We are a full-service company catering to the needs of marinas, boat builders and shipyards alike, with a focus on reliable partnership for years to come.